Welcome to the website of the DRSA. We are an all volunteer organisation dedicated to supporting the Dartmoor Railway. English Electric weekend, June 8th and 9th. Details on the EE weekend page. Our DVD 'The Southern's Withered Arm and other lines in South West England' makes an excellent gift for the local railway enthusiast. Details on the DVD page. 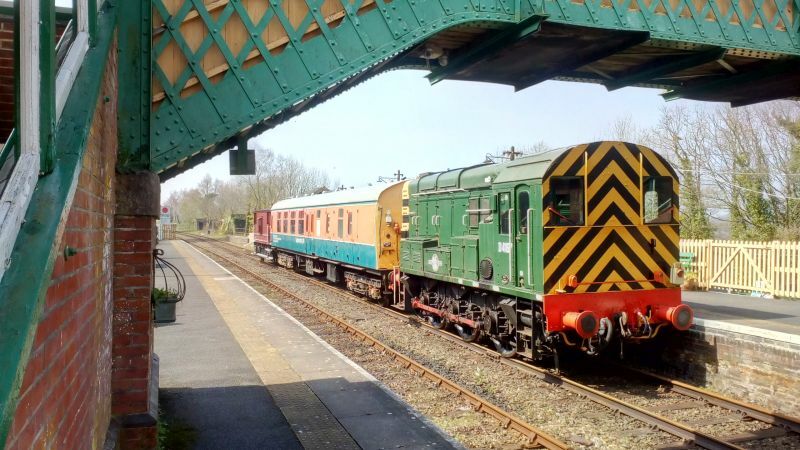 DR's colourful heritage set comprising LMS brakevan 731411, Mk1 BSK RDB 975046 aka Lab11 and class 08 D4167. Missing was Mk2 FK S13436, currently sidelined with a brake problem. With apologies for mobile phone photo lighting quality. Our website isn't very smart or cool, but we try hard to keep it up to date, informative and free of errors, without taking ourselves too seriously. Constructive criticism is always welcome. Please send comments, suggestions, complaints and, above all, praise, to jonathankelsey@btinternet.com. We suggest that regular visitors start at the Website Updates page, to see what's new since the previous visit. We are also on Facebook. Our EasyFundRaising account enables you to donate to DRSA at no cost to yourself everytime you shop online. Please consider using it. Our Downloadable Resources page contains a number of useful documents.